Over 350 enthusiasts, urged on by the crowd and the first class New Addington Steel Orchestra, poured out of Lloyd Park Avenue at 10.15 into Coombe Road, and soon after the sharp left it became clear that a two man race for the title was evolving between Croydon Harrier Jake English and Sam Wade of Brighton Phoenix. These two progressively stretched their advantage as they passed the Shirley Windmill and by the time the duo entered Sandilands, they were well clear of any obvious challenge with Wade just showing the edge. And so it remained with him entering the finishing straight alone to win in 33;11 for the Coversure Decanter, with English running home strongly in second for a 33:32 clocking. Over a minute passed before Bronze medallist Andrew Whelan of Cambridge Harriers closed in, in 34:39. 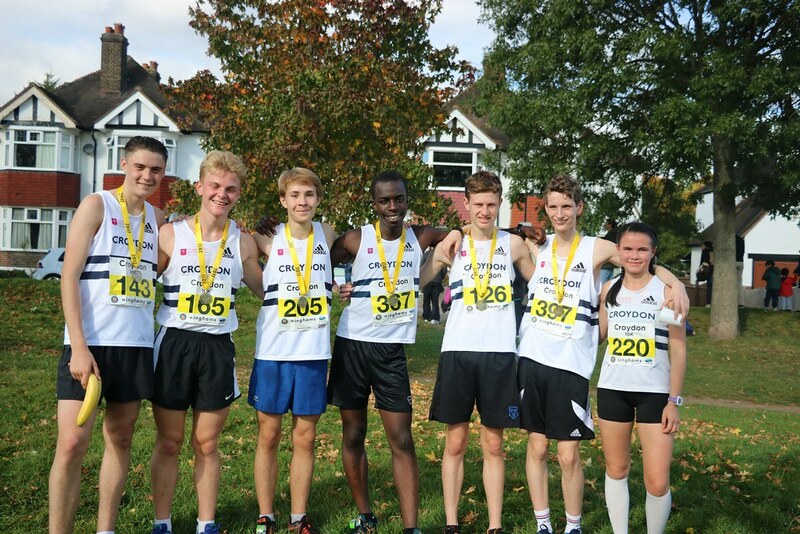 The next five places were filled local athletes headed by Neil Reissland of South London Harriers, an excellent performance from the evergreen Vet 50. Nearer the lower end of scale Croydon Harrier Patrick Lucas was rewarded for his journey from Loughborough University with a 7th Spot in 37:16, edging out Angus Harrington (Trinity School ) who impressed as first Junior man home just one second adrift. Croydon’s own Robbie Tambling finished in 20th spot as third Junior Man, in 38:22. Trinity School teacher Helen Ward was the delighted leading lady, 29th in 39:58 to win the Coversure Rosebowl. In a class of her own, with runner up Emanuela Castelnuovo (Fulham RC) 70th in 43:39. Bronze medallist Georgina Furze of Woking AC, place 71st overall 16 seconds behind. 100th Croydon Harrier Jessica Moore enjoyed an excellent Croydon 10k debut to win the U20 women’s title in 45:41. Brendan Morell (SLH) was first home in the 3k U15 run in12:12.22, with Harrier Douglas Aikman 2nd in 12:13.26. Leanne More, took the girls’ title finishing 5th overall. Encouragingly there were more corporate team than ever and entries continue to come from other parts of the UK. The furthest travelled athlete was V65 Robin Wombill, a former Selhurst Grammar Sshool student with others travelling from Dover, Dudley and Stourbridge. #Croydon10k completed today, south Norwood park run yesterday, very happy with 2 pb’s 🙂 but feeling it now! Alanna at the #croydon 10k . Well done to team BearWolf at the Croydon 10k today. Awesome work.